The tomb in the parish church of St.Michael at Hoveringham is surmounted by effigies of Sir Robert Goushill (or Gouxhill) (d.1403) and his wife Elizabeth Fitzalan. Elizabeth was grand-daughter of King Edward I, and sister of the 15th Duke of Arundel. Robert was Elizabeth's third husband, she having been previously married to the Duke of Norfolk. Robert and Elizabeth were married at Hoveringham in 1401. Two years later Robert was wounded whilst fighting for Henry IV at the Battle of Shrewesbury (21st July 1403). It was for his bravery at this engagement that Robert was knighted. At first he was badly wounded, being then treacherously stabbed to death by his servant. 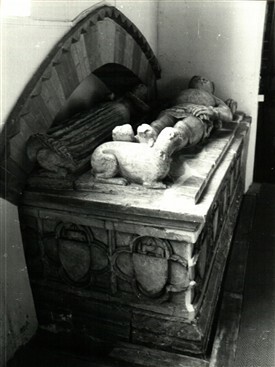 Hoveringham church was rebuilt in red brick in 1865, but the early 15th century Goushill alabaster tomb was preserved. The tomb was originally located in the south transcept of the old church. At the time of the re-building it was moved and amended in size so as to fit into an arched recess. Sir Robert's head rests upon his crested helmet. He has armour on his arms and legs and chain mail (all well depicted). An elaborately carved sword belt is also well-preserved, although partially broken away. In his left hand he holds a gauntlet; the right arm is missing although it is presumed to have been depicted holding his wife's hand. Elizabeth is clothed as a peeress in a long robe with coronet denoting her rank. The tomb now bears neither arms nor inscription. Sir Robert left no male heirs, and his property passed to his daughters. In this way the Goushill family connections with Nottinghamshire ceased. This page was added by Website Administrator on 15/07/2014.